A full colour map of the Warwickshire Ring and Ashby-de-la-Zouch Canal suitable for both waterways and leisure users. 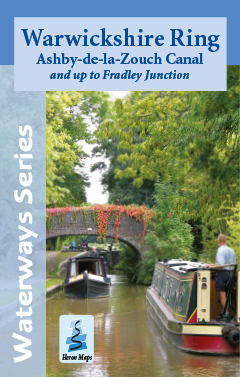 This map gives detailed coverage of the Warwickshire Ring, Ashby-de-la-Zouch Canal and up to Fradley Junction, on the Trent & Mersey Canal, with emphasis on the waterways and information useful and relevant to users of the waterways without neglecting other leisure users. The map detail is complimented by information panels and photographs. The Warwick Ring comprises the Grand Union Canal, from Napton Junction to Birmingham, the Birmingham and Fazeley Canal, the Coventry Canal and the northern section of the Oxford Canal, from Hawkesbury Junction to Napton Junction. This 100 mile ring offers a mixture of both tranquil rural and urban cruising. Whilst possible to complete in week, it is perhaps better suited a more leisurely trip of a fortnight. This allows more time to explore some of the delights including elegant Royal Leamington Spa, and Warwick and it's fine medieval castle. Moor in central Birmingham's Gas Street Basin and enjoy all the culture, cuisine and shopping our second city has to offer. Those seeking thrills should visit Drayton Manor near Tamworth or the town's indoor ski slope. A slower paced diversion is to be had continuing up the Birmingham and Fazeley Canal from Fazeley Junction to Fradley Junction, the junction of the Trent and Mersey Canal with the northern section of the Coventry Canal. Enjoy a drink in The Swan after the rigours of the 11 mile lock free cruise before returning to Fazeley Junction to continue along the eastern side of the Warwickshire Ring. The eastern side of the ring provides near lock free cruising with Glascote Locks, the flight at Atherstone, Hillmorton's paired locks and the stop lock at Hawkesbury Junction the only ones to hinder progress. This includes the 22 mile Ashby-de-la-Zouch Canal, a contour canal, it meanders through rolling countryside skirting the edge of Hinckley otherwise encountering few villages. The canal passes Bosworth Field, site of the final battle in The War Of The Roses, now a country park with a heritage centre with exhibitions, re-enactments, falconry and battlefield walks. At Hawkesbury Junction continue along the Coventry Canal into the city from which it takes its name, along a 5 mile lock free stretch of canal lined with artworks to the restored basin close to the heart of the city. This tourist map is at 1:50000 with detailed town plans of Braunston, Warwick, Kingswood, Tamworth, Atherstone, Nuneaton and Coventry at 1:12500. An additional plan of the heart of Birmingham at 1:10000 is also included. The Warwickshire Ring map is available to buy online or by telephone from our business partner, Guidepost. Click on the logo below to visit their store.